TAKE 3 MED SIZED WASHED WITH SKIN ON WHOLE SWEET POTATOES AND CUT INTO LARGE ROUND SLICES LIKE IN THE PICTURE (keep the skin on-lots of nutrition in them) THEN BOIL IN POT FOR 10 MIN. WHEN POTATOES ARE DONE, DRAIN AND RUN COOL WATER OVER THEM. ADD THEM TO THE BOWL AND SPRINKLE WITH SALT, PEPPER AND FRESH PARSLEY OR DILL. MIX GENTLY TO COAT THE POTATOES AND CHILL IN THE FRIDGE. BRING IT TO YOUR SUMMER PARTIES OR JUST MAKE AS A SIDE DISH FOR DINNER WHENEVER! I MADE A BATCH AND HAVE BEEN EATING IT FOR BREAKFAST, SNACK, LUNCH AND DINNER ALL WEEK! IT’S PRETTY MUCH DELICIOUS AND GOES WITH EVERYTHING! 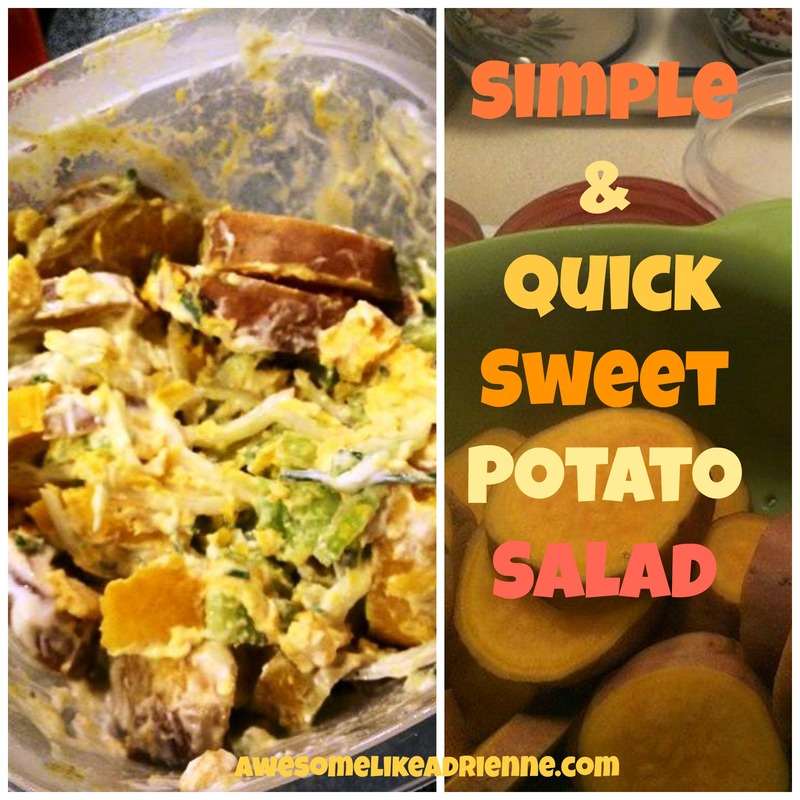 Posted on April 28, 2014 April 28, 2014 by awesomelikeadriennePosted in EatTagged easy, hard boiled eggs, healthy, Parties, potato salad, quick, sweet potato salad, sweet potatoes. I worked out this morning. I did the treadmill, weights, push ups and a couple of machines. I was tired when I finished. I only did the workout for a half hour. Oh well, Hopefully I can work up to an hour. Great job Pat!!!!! Proud of you! !